This is a very small machine of this type and can add up to just £999 19s 11d. 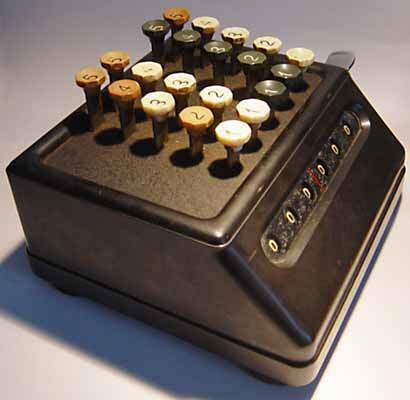 One of the first Plus models, which were based on the Petters design that Bell Punch bought from that company in 1936. On the bottom is a list of patents, see photograph below. The British ones had been taken out by Guy Bazeley Petter, with rights assigned to Petters, Limited, Yeovil, England (the internal combustion engine manufacturer). One of the patents had been applied for in 1922 and the others in the early 1930s. 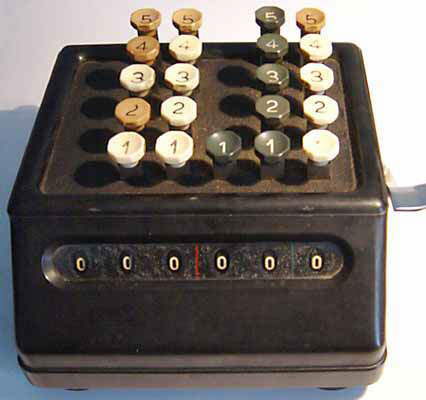 This is one of the first Bell Punch calculators based on the Petters design that Bell Punch bought from that company. The upper plate announces that the sole distributor for Scotland is John Macleod Limited, of Glasgow. 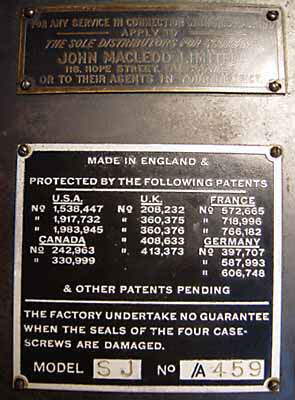 The lower plate lists patents that covered the mechanism. All of the U.K. patents were applied for by Guy Bazeley Petter and Petters Limited of Westland Works, Yeovil, Somerset, from whom Bell Punch acquired them. Grateful thanks go to Keith Dale and Roy Paget for providing these photographs of this interesting machine.